There was similar overkill across the map. SAC assumed that some of its bombers would be shot down by Soviet air-defense batteries and that others would miss their targets. So still more bombs had to be dropped on each target  and more bombers had to be funded and built. The SIOP came down to this: in the event of sudden war with the Soviet Union, the U.S. would shoot all its nuclear weapons on alert  1,459 nuclear bombs, totaling 2,164 megatons  against 654 targets in the U.S.S.R., Eastern Europe and China, killing 175 million people who happened to live under communist rule. When John F. Kennedy became President in January 1961, his Secretary of Defense, Robert McNamara, was briefed on the SIOP  and was appalled by its casual destructiveness. One slide in the briefing showed that a multimegaton bomb would be dropped on Albania, whose rulers were breaking away from the Soviet bloc, because a large air-defense radar was based there. As McNamara and his entourage were leaving the briefing room, the SAC commander, General Thomas Power, said, smiling, "Mr. Secretary, I hope you don't have any friends or relations in Albania, because we're just going to have to wipe it out!" McNamara glared intensely at the general with contempt. McNamara altered the SIOP in many ways, allowing the President, in case of war, to attack Russia but not China, to attack military targets but not cities and to attack some types of military targets but not others. Subsequent Defense Secretaries refined the SIOP still further. But the dynamics of the arms race were set in motion. 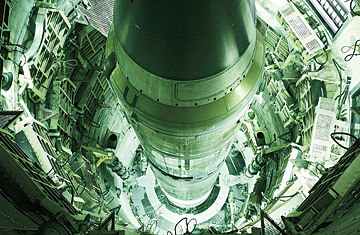 The U.S. arsenal hit its peak in 1967, with 31,255 nuclear weapons. The Soviets matched, even exceeded this level in the early '80s, but well before then, few regarded either side as "superior" in strength. Each side had more than enough nuclear firepower to obliterate the other. In the mid-1970s, when some hawkish critics were worrying that the Soviet Union might soon attain "superiority," Henry Kissinger, then President Richard Nixon's National Security Adviser, exclaimed in frustration, "What in God's name is 'strategic superiority'? What can you do with it?" By the time the Soviet Union collapsed in 1991 and the Cold War vanished with it, the U.S. still had 19,008 nuclear weapons. The sharp cuts came, as was only natural, during the 1990s. They were due in part to arms-reduction treaties and in part to unilateral measures on both sides. By the time George W. Bush became President in 2001, the U.S. arsenal was down to 10,526 nuclear weapons. When Barack Obama entered the White House in 2009, it had been cut to 5,113 (2,200 of which were "strategic weapons," that is, operational long-range warheads and bombs). Russia has about 4,850, of which about 2,700 are strategic weapons. But that's not the only rationale. U.S. policy has long held that an attack on key allies  fellow members of NATO as well as Japan, South Korea, Taiwan and perhaps Israel  would be regarded as an attack on the U.S. and that our response might be nuclear. This would be the case even if those allies were attacked with only conventional weapons. (For this reason, when Obama and his aides conducted a review of U.S. nuclear strategy last spring, they decided not to adopt a "no first use" policy. The Obama review did, however, state that the U.S. would not launch a nuclear first strike against countries that are nuke-free and in compliance with the Nuclear Non-Proliferation Treaty.) Assuming that nuclear weapons still serve a purpose, how many does that purpose require? Do we still need to target all of Russia's ICBM silos? Let's say we do. There are 383 of them. So firing two warheads at each silo would require 766 warheads. Add a couple hundred more for a possible war with China, plus a few dozen for other threats, such as North Korean nuclear sites, underground facilities in Iran ... Name your favorite threat. See TIME's photo-essay "Securing Loose Nukes in Chile." See pictures of what may have been Syria's nuclear reactor.